Wiring is an important part of the process of styling your bonsai and nearly all well designed bonsai have been wired at some point in their development. Though at first a daunting technique to master, it gives the bonsai enthusiast better control and manipulation of the trunk and branches of his/her bonsai. By coiling wire around the limbs of the bonsai, the enthusiast is able to bend the tree into a desired position upon which it is held by the wire. In a matter of weeks or months, the branch or trunk 'learns' and stays in position even after the wire is removed. With the use of wire, straight trunks or branches can be given more realistic movement. Young branches can be wired into a horizontal or downward position to create the illusion of maturity. Foliage or branching can be moved to 'fill in' bare areas of the trees silhouette. Without wiring, the enthusiast would otherwise have to wait for shoots to grow in the desired direction. With wiring, existing growth can be manipulated there instead. Bonsai wire is normally only available from Bonsai Nurseries and Online Shops. It is available as anodised aluminium or annealed copper; aluminium wire is generally easier to apply for beginners and can be reused (though this is not recommended). Copper wire is more difficult to apply but has more holding power. Once it is has set into position it cannot be re-used. Wire cutters are also necessary for removing wire from branches and for cutting suitable lengths. Bonsai wire cutters are available but ordinary wire cutters are adequate if the wire can be cut at the very end of the cutters jaws. Aluminium wire is sold in mm thickness. The thicker the wire, the stronger it's holding power. Copper wire is sold according to its gauge or sometimes mm. Typically, you will need a wire thickness a 1/3 that of the trunk or branch you are trying to bend. Copper will hold better and thinner wire can be used; aluminium the reverse. 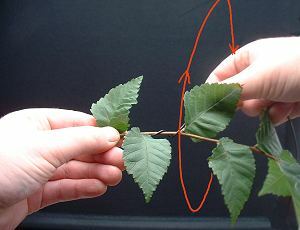 The actual size needed to bend a branch will vary according to the strength and pliability of the tree species you are wiring. You will need 3 or 4 different thickness to fully wire a tree; try buying reels of 1mm, 1 1/2mm, 2 1/2 and 4mm to start with. As you gain experience you will be able to identify exactly which sizes you tend to use for the size and species of bonsai you are wiring. Note that Iron and Steel are very poisonous to Junipers and some other coniferous species. Steel produces a chemical reaction with the sap causing a disease called 'blackrot' that quickly spreads through the tree causing it's death. For Rhododendron species (including Azalea), copper is reported to be poisonous. The wire you use must be thick enough to bend the branch effectively and for it to remain in position but thin enough for the wired branch to be manipulated and for neatness. The process of wiring and bending causes a series of minute splits and fractures in the layers underneath the bark of the branch; as the cambium layer repairs and heals this damage, the new position is 'learnt' by the branch. The faster the branch is growing the faster it heals, the sooner the wire can be removed without a return to its original position. 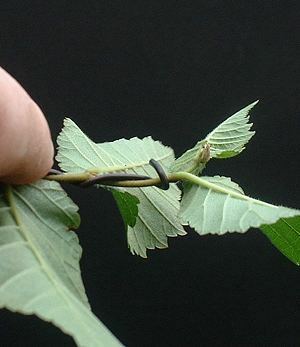 Wiring a branch during the Spring or Summer when growth is vigorous can lead to deciduous branches taking to their new positions within as little as two or three weeks. 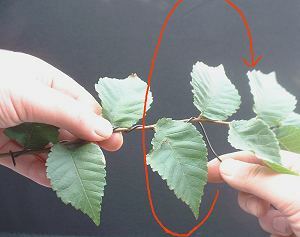 Branches that are wired in Autumn or Winter can take months to fix into position. Similarly, naturally fast growing species such as Elm and Maple will require far less time to set into their desired shape than slower growing Junipers or Pines whatever time of year they are wired. Almost all bonsai books have a Chapter devoted to the actual process of wiring and using the trunk or close-by branches as an anchor, so I will not repeat too much of this information here. · Hold the beginning of the wire/anchor point firmly with your left hand at all times; as you coil the wire further down the branch, you can also move the position that you secure using this hand. At all times, the wire that has already been applied should not be able to move whilst you continue to wire the remainder of the branch. · With the wire in your right hand, feed the wire through your thumb and first finger as you make a circling motion with your wrist around the branch, carefully work down the branch towards your body. · You can either cut a length of wire approximately 1/3 longer than the branch you are wiring or as I prefer, you can keep the reel of wire in the palm of your hand and cut to length when you have reached the tip of the branch. Always wire from the base of the branch to the very tip. · The last turn of the wire should be at 90° to the direction of the branch to secure the end of the wire at the very tip. · On fast growing species it can be worth wiring more loosely to reduce the risk of the wire cutting in. · When wiring an entire tree, always start with the trunk, wire the primary branches and then the secondary branches. The branches of a Juniper bonsai that have been recently repositioned using coiled wire.